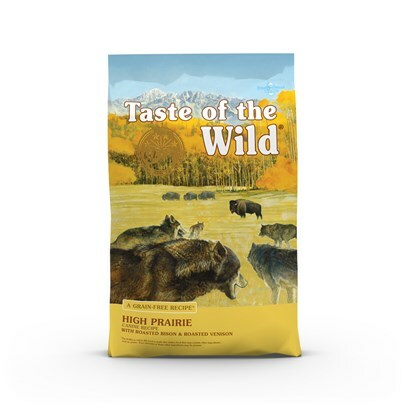 Taste of the Wild, High Prairie Canine Formula with Roasted Bison and Venison, offers the quality balanced nutrition you expect for your best little (or not so little) buddies. Your dog will crave the natural proteins of the prairie, blended with berries, sweet potatoes, and tomatoes, to make this perfectly unique, highly nutritious, mouth watering, and delicious, grain-free formula. Boost your dog's immune system with the vitamins and anti-oxidants Taste of the Wild, High Prairie Canine Formula with Roasted Bison and Venison provides, while containing no fillers, preservatives. Bison, lamb meal, chicken meal, egg product, sweet potatoes, peas, potatoes, canola oil, roasted bison, roasted venison, natural flavor, tomato pomace, ocean fish meal, salt, choline chloride, dried chicory root, tomatoes, blueberries, raspberries, yucca schidigera extract, dried Enterococcus faecium fermentation product, dried Lactobacillus acidophilus fermentation product, dried Lactobacillus casei fermentation product, dried Lactobacillus plantarum fermentation product, dried Trichoderma longibrachiatum fermentation extract, vitamin E supplement, iron proteinate, zinc proteinate, copper proteinate, ferrous sulfate, zinc sulfate, copper sulfate, potassium iodide, thiamine mononitrate (vitamin B1), manganese proteinate, manganous oxide, ascorbic acid, vitamin A supplement, biotin, niacin, calcium pantothenate, manganese sulfate, sodium selenite, pyridoxine hydrochloride (vitamin B6), vitamin B12 supplement, riboflavin (vitamin B2), vitamin D supplement, folic acid.